Tuscany is probably the most loved region of Italy and whilst Rome is the capital, Tuscany is the heart. Stretching from the Apennines to the sea, midway between Milan and Rome, the region is the picture of Italy we all have in our mind's eye. Its changing scenery is unmatched anywhere else in Italy. Its towns are famous for their wealth of fine architecture and art, but visitors often go home even more enthusiastic about Tuscany's unspoilt hilly landscapes, about the delicious Chianti wines produced by vineyards on those hills, and about the robust and flavorful Tuscan cooking. Winding roads lead through the magical Chianti countryside, past small, picturesque hilltop villages and beautiful stone farmhouses. Tuscany is almost certainly the most loved region of Italy. It presents that ideal green Italian landscape, dotted with pink stone hilltop towns, where cypress trees stand between olive groves and vineyards. The capital of Tuscany is Florence, a centre of the Fifteenth century Renaissance. 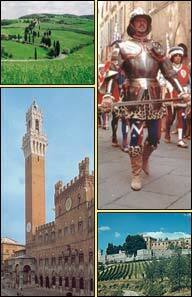 Siena is probably the most noble Tuscan city with its roots going back to the Etruscan period. It is probably best known for its 'palio' which has been passed down from generation to generation, and recollects Siena's rich history and frequent periods of war notably those conducted against the Guelfi Fiorentini. The Palio itself is a famous horse race whereby the horses hurtle around a shell shaped course whilst the jockeys use any means possible to get to the post first. The race takes place twice a year and keeps alive the fighting spirit of Siena's citizens. This magical property, Alla Corte del Sole, was a Franciscan monastic village in the Sixteenth Century. Lovingly restored by its present owners, it is today an elegant, small hotel with spacious rooms, furnished with authentic antiques and beautiful fabrics . . . and the bathrooms are impeccable. Situated on the hilly border between Tuscany and Umbria just outside the ancient town of Cortona, with the historic cities of Siena and Perugia nearby, not to mention the well known vineyards of the Chianti, this historical building with its breathtaking views over the Tuscan hills will make this a cooking holiday to savour and remember for a long time after you have returned home. Set in the most delightful grounds, Alla Corte del Sole offers the sophistication of tranquil and relaxed setting. Extensive gardens provide space for reflection whilst the swimming pool captures the imagination. Chef Jonathan Arthur started his culinary career managing and cooking for Huffs small chain of trendy restaurants in Chelsea, Camden Lock and Hampstead in the eighties. During this time he developed a passion for the history of food and its importance to civilisation. This naturally brought him to Italy where he now lives near Cortona. In great demand as a home chef for villa parties with clients coming from as far afield as New Zealand, Australia, the USA and Dubai, Jonathan took up teaching almost by chance. In the past he has been the guide and inspiration on many cookery courses assisting local chefs and visiting Master Chefs in everything from translating to procuring the best and freshest foods for the lessons. It was at this time that he both realised that not only does a teaching chef have to know his subject he also has to communicate directly with his clients. He does this with a natural panache and enthusiasm so guests really can get the flavour of Italian cuisine first hand. Due to his enthusiasm and our organisers knowledge of the territory, over the past three years they have been asked to organise interesting food and wine adventures. Most notably the Food TV Channel from the States wanted an expert to guide them through the minefield of bringing top New York chef Rocco di Spirito to his ancestral home near Naples. Without Jonathan and his knowledge and expertise both in handling local squabbles and finding the right locations it could have been a disaster. It was a great success. When UC Davis, the USA's top wine University, wanted a knowledgeable guide to take one of their experts and a group of winemakers from California around Italy Jonathan was chosen to lead them - another great success. More recently he has been over to North Carolina to cook and give demonstrations at the Camden Fine Arts Centre and in February 2003 he was again in demand in the States. This time giving two classes and preparing a buffet for 800 guests in Salem, Massachusetts, at the annual 'Chevrolet Corvette' party. In October 2003, one of America's top young chefs, Paul Mattison of Mattison's City Grille and Mattisons Steak House, Sarasota and Mattisons American Bistro, St. Petersburg Florida, brought a select party over. They joined up with a small party from England and had a great time. Why not persuade your favourite chef to bring a party over? I have left this page on the site as it is an example of a cooking holiday. This particular holiday is no longer available and it is not endorsed or recommended by Hub-UK nor should it be read as being a recommendation of the organiser. If you want my personal comments about this sort of holiday feel free to email me.